Unlike a hotel, you will be the only clients for the day and we are therefore in a position to offer total privacy for your meetings in quiet and spacious surroundings. Two large rooms are reserved exclusively for your use, and a further one can be made available for private discussion if needed. 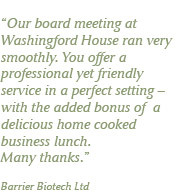 We would take pleasure tailoring our facilities around your individual corporate requirements to enable your day at Washingford House to run efficiently and smoothly. The principal meeting room (5m x 6m / 16' 6'' x 19' 10") seats 12 people in a board room configuration. In a class room style it would seat 15, whilst a theatre layout holds up to 16 people. A generous reception room (10.9m x 5.2m / 35' 9" x 17' 3") will be used to welcome you on arrival with tea, coffee and home-made biscuits. This south and west facing room leads directly onto the terrace and garden, delegates being welcome to sit outside during the Spring and Summer months. We offer a half-day package, full day or breakfast meetings. The washroom facilities are downstairs and the house is easily accessible for wheelchair users.